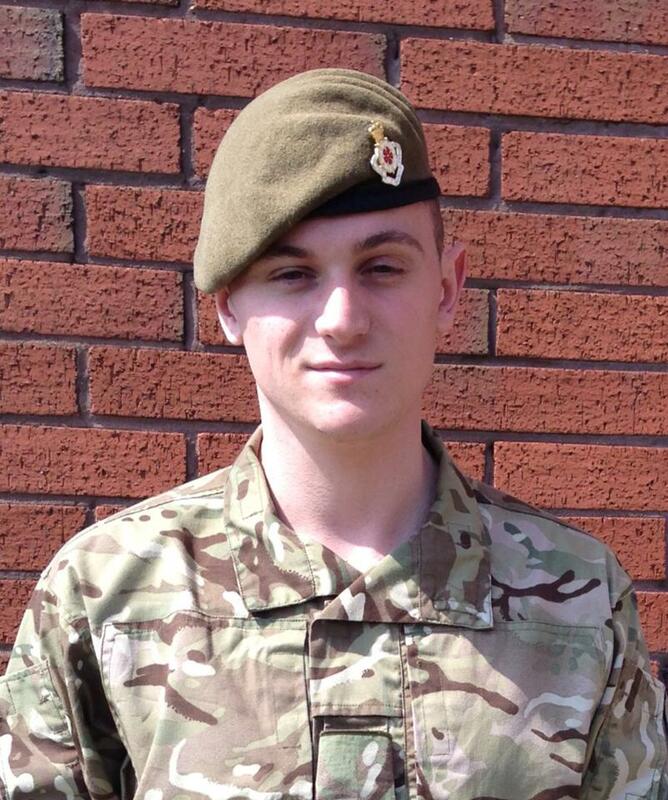 Lance Corporal Damian Dunphy is a trombonist with the Heavy Cavalry and Cambrai Band (HC&C Band) based in Catterick. Having served such a length of time in Yorkshire Damian’s roots are well and truly established. He plays for a number of orchestras in the North East in addition to a number of brass bands, he is also the Musical Director of a local brass band and has conducted a number of other bands in the area. 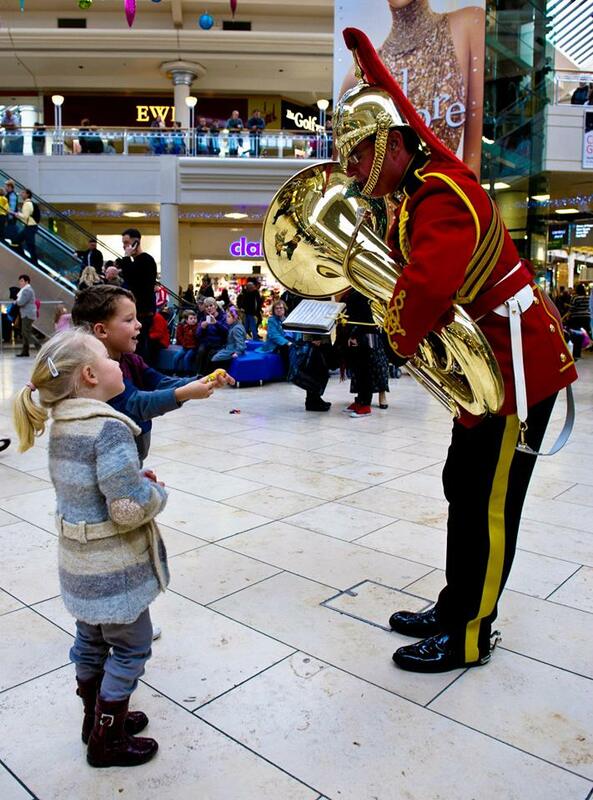 On Saturday 7 December musicians from the Heavy Cavalry and Cambrai Band, the Band of The Royal Regiment of Fusiliers and the Royal Signals (Northern) Band were tasked to visit the Metrocentre for something far less mundane than assembling this year’s Christmas presents, this was the Corps of Army Music’s third flashmob event. Okay, granted you cannot assemble 60 musicians spontaneously via social media, indeed the events take a great deal of choreographing, but the result has the appearance of spontaneity about it. The sixty musicians, regular and reserve, met for the first time at 8am on the morning of the event. Any thoughts of grabbing a bacon butty were quickly put aside as it became clear that time was to be a bit of an issue, with the mall opening to the public at 9am. The Director of Music and Drum Major met with the film director to discuss camera angles, choreography and the overall look of the film, whilst the Band found their positions on the floor. The overall shape of the Band once assembled was to be that of a Christmas tree and the best way to rehearse creating formations like this is to work backwards from the finish position. To that end musicians were herded into position, given a marker and in some cases tape-markings were placed on the floor. 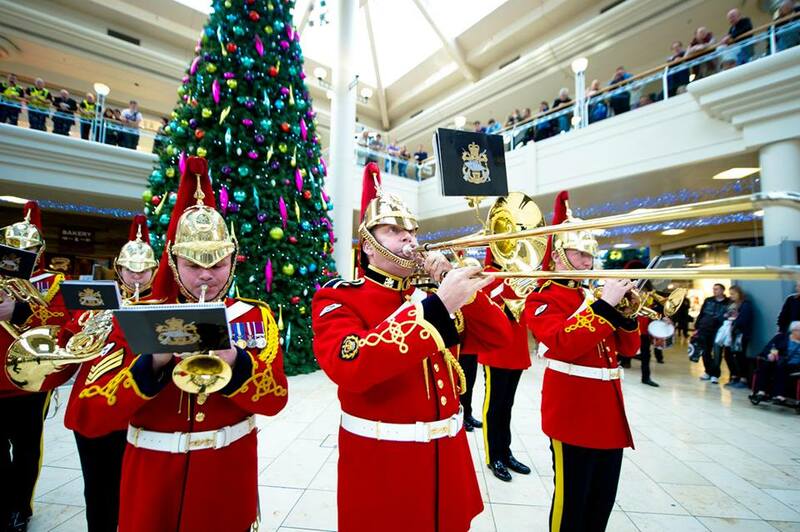 The show was to start with a soprano saxophone ‘busker’ being joined by a brass ensemble and then musicians were to emerge from various parts of the mall in an apparently random fashion before forming our Christmas tree shaped marching band. After half an hour or so a crowd of curious and bemused Metrocentre workers had gathered to see what all the commotion was about, their elated reaction to the first run through verified that we had chosen a popular programme for the event! The massed bands then returned to the St George’s Army Reserve Centre, in Newcastle, for a musical rehearsal and some well earned pastry based confectionery, courtesy of the Band of The Royal Regiment of Fusiliers. The performance was scheduled for peak shopping time (1pm) in an atrium in the mall. Musicians gathered together in various service bays and fire escapes out of sight of the crowds waiting for their musical cue, which was to be Lance Corporal Andy Lightfoot on soprano saxophone playing the introduction of ‘A Winter’s Tale’. For the occasion Lance Corporal Lightfoot was dressed as an Elf, and prior to the flashmob he was to be busking next to a Christmas tree. Nobody had quite expected him to look so adorable, and combined with his excellent busking skills, the public were donating money quite quickly, which caught him somewhat by surprise, he hadn’t planned for that element of the event. The money will be donated to Help for Heroes the next time the Heavy Cavalry and Cambrai Band perform for the Pheonix House Recovery Centre in Catterick Garrison, North Yorkshire. With the predictability of the rising sun the cleaners had removed the tape markings from the floor and the fact that the mall was now full of people made finding visual references a tad more difficult. It all went as planned though, and the sight of military musicians playing whilst descending an escalator will no doubt live in people’s memories for a long time. Cpl Brown meets surprised children. The Band performed ‘A Winter’s Tale’ and ‘Santa Claus is Coming to Town’ both from Ian McElligot’s excellent selection simply entitled “Christmas”, to a warm and appreciative audience. The feeling from the ‘shop floor’ was that this crowd really enjoyed the performance. The Band left the atrium to Rodney Bashford’s march Wassail and the music and the performers disappeared as swiftly as they had arrived. They say it’s always good to leave the audience wanting more and that was definitely the case with this performance. 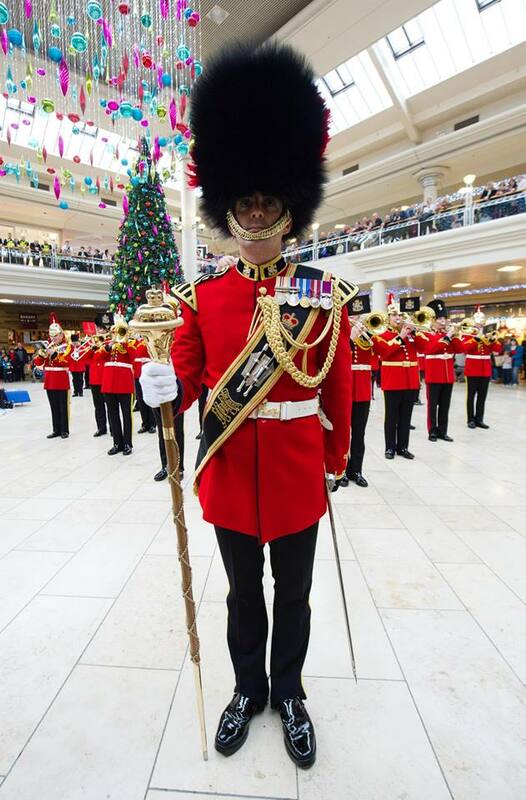 Following the flashmob on Saturday the Heavy Cavalry and Cambrai Band stopped at the Metrocentre to entertain the crowds with some more music. Whilst we performed to the public, the Army Media Team were editing the video ready for distribution. By the time the bands had got changed and boarded the transport for home the video was already online and had already generated thousands of hits both on Facebook and YouTube. By the time the bus arrived back at Catterick the event had been shown on the local news. Good news does indeed travel fast. Lastly we would like to wish you all a Merry Christmas from all members of the Corps of Army Music and Army Reserve Bands. Musician Perry O’Brien is a member of the Band of The King’s Division. 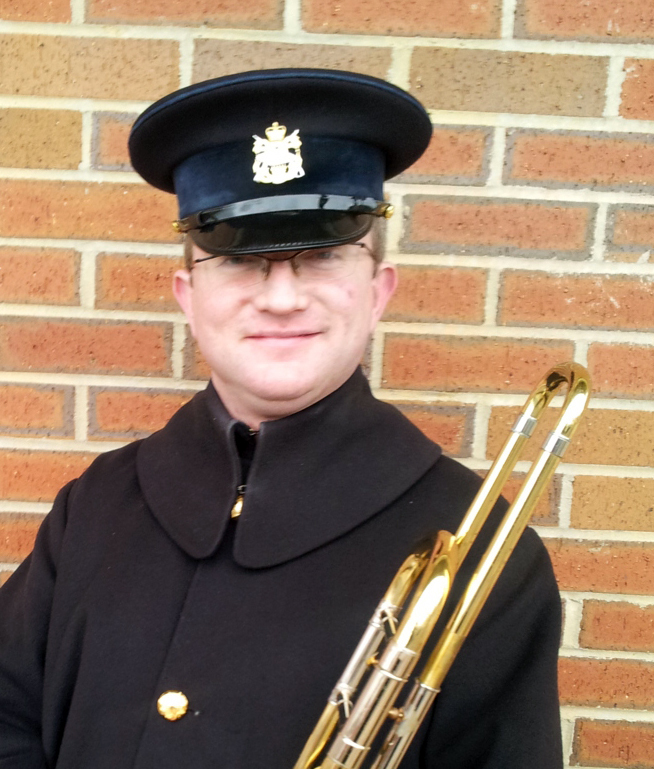 He was recently part of a short term training team along with members from the Heavy Cavalry and Cambrai Band sent to Kuwait to assist with music training of the Kuwait Army Band. The Heavy Cavalry and Cambrai Band were recently tasked to provide a short-term training team for the development and positive forward direction of the Kuwait Army Band. Aided by members of the Band of The King’s Division, a team of five personnel ventured to the middle-east. Upon arrival at Kuwait Airport, we were hunted down in the crowd by Kuwaitis from the British Embassy. We were humbly escorted to the VIP lounge to drink Turkish coffee and Chai (drinks we were to consume thousands of during our stay) while our baggage was being retrieved and visas obtained on our behalf. We met with our point of contact who briefed us on local etiquette, discipline and culture before moving to the Moevenpick Hotel. We were very well catered for at the hotel and we could see that the Kuwaitis were very grateful to have us over there. Our first day with the band added another 12 glasses of Chai (an extremely sweet tea with extra sugar but no milk). We met the band who demonstrated their day-to-day schedule and performed how they usually would. Their ensemble consisted of 2 ‘Maestros’, 17 trumpets, 2 Flutes, 12 Clarinets, 6 saxes, 4 Trombones, 3 Euphoniums, 2 Tubas and a 10-strong percussion section. Our aim was to focus on the improvement of the ‘Maestro’s’ technique and confidence to enable them to carry on improving the band after we had finished our short time there. This was no easy job for the Director of Music Captain Riley as the Maestros did not speak English. Captain Riley was no silver tongue in Arabic, either! However, the local translators from within the band did a fantastic job of conveying his lessons to the Maestros. 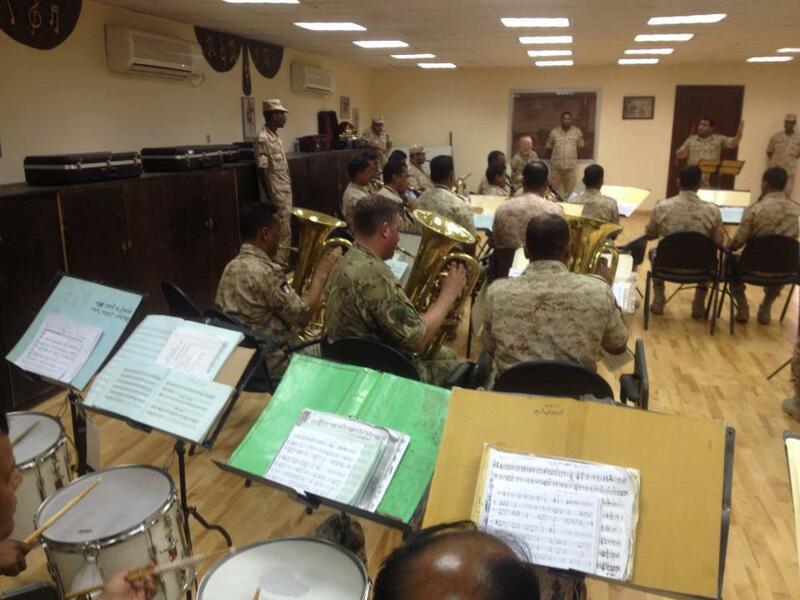 Almost instantly – with the help of the team sitting within the sections, a stern approach to reducing dynamics and the number of musicians performing at one time being decreased – we established the progression of significant musical improvement and our ambitious goal of improving the standard of the Kuwait Army Band soon became vastly more realistic. They already produce an incredibly high standard of pipes and drums so there was no reason why the wind band element could not be as successful. By the end of the first week, the Kuwait Army Band had demonstrated significant improvement and set up a meeting to perform for the Chief Of General Staff, Kuwait Army. With the help of the brass quintet and under the direction of Captain Riley, the performance was a huge success; The Chief of Staff was very pleased with the improvement of the band and it was clear to see that the work of the training team was having a monumentally positive impact on the standard of musicianship. Over the next couple of weeks, we were hosted by British Officers of the British Military Mission. 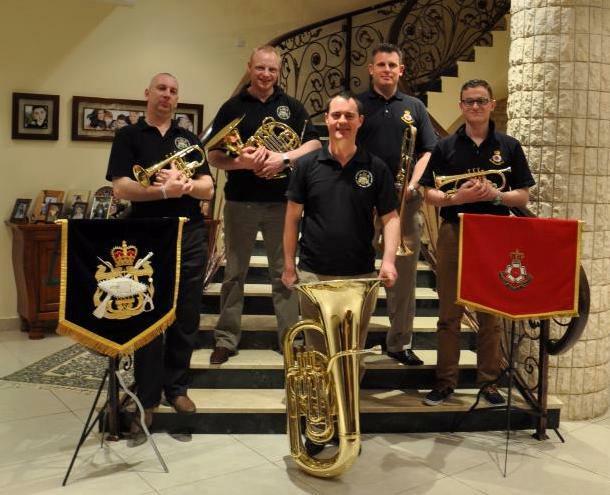 Our team formed a brass quintet to allow us to perform as a small ensemble whilst we were in Kuwait. We performed with dozens of talented British children to raise money for a charity supporting orphans in Argentina. We also performed at the Raddison Club for the public and one night in the desert near Iraq, with cyalume® (light sticks) being our only source of light – this was the most interesting performance I have ever been involved in. We were also due to provide musical support at the Queen’s Birthday Party, but this was postponed out of respect for the late Margaret Thatcher. We visited Kuwait English School and The English School to deliver educational workshops to classes of children. This added another interesting dimension to our already diverse visit. The children thoroughly enjoyed our lessons on all of the instruments, even if it was just the teachers that were old enough to remember “Pigbag”! Our drivers were on call 24/7 and had our every need catered for before we could even ask. We were made to feel comfortable and welcome everywhere we went, visiting museums, bazaars, beaches, traditional cafés and impressive national buildings. There were only a few square inches of Kuwait city that we didn’t get to see! Overall, Kuwait offered an extremely interesting and valuable experience to each one of us. Not only did the Kuwait Army Band benefit from the effective and positive direction we delivered, but we gained a wealth of knowledge in return. It was amazing to see the effect we could have on the Kuwait Army Band and to see their improvement as a direct result of our input. I suppose the 35 degree sun, incredible hospitality and interesting culture were the few added bonuses to a very rewarding mission.